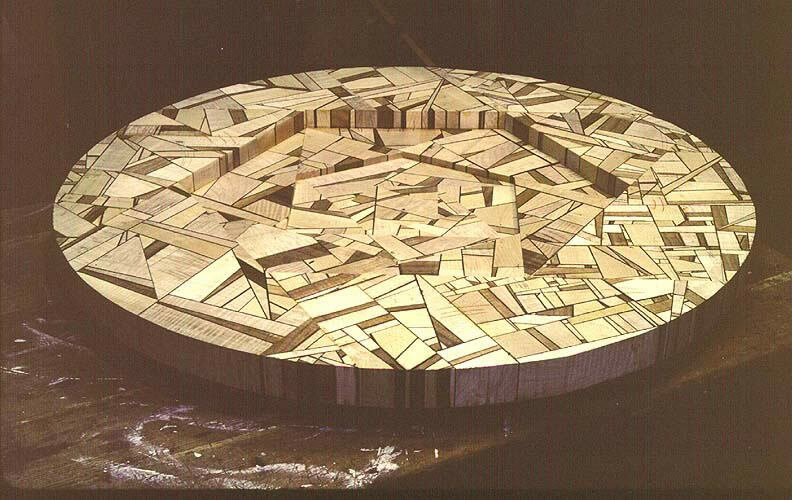 Vessel #47 was built up from a hexagonal plan (fig. 2) (other pieces were built up on a square plan). Sometimes people think I just glue up any old scraps I have handy to make these pieces. Not so, I have in mind an overall effect from the beginning. The early pieces (of which this is one) were made largely of small scraps and as I ran out of small scraps I used larger and larger pieces of wood to begin with. Toward the end of this series I was using mostly new wood. 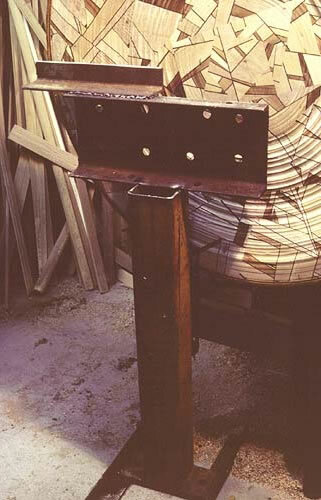 Two or three large pieces would be glued together with some veneer in the joints. 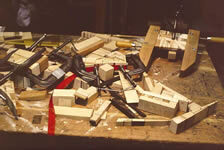 Then I cut this block apart (not on the joints) reoriented the pieces and re-glued them. This process was repeated until I had the patterns I'm looking for. 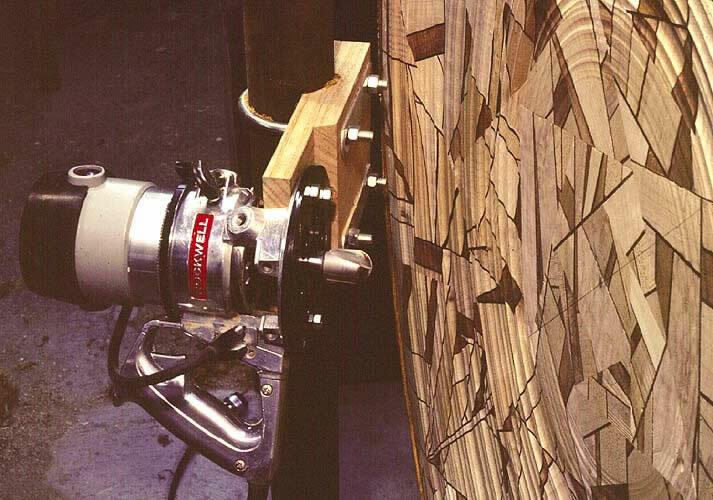 For this piece I steered the glued up blocks toward the appropriate triangular shapes. 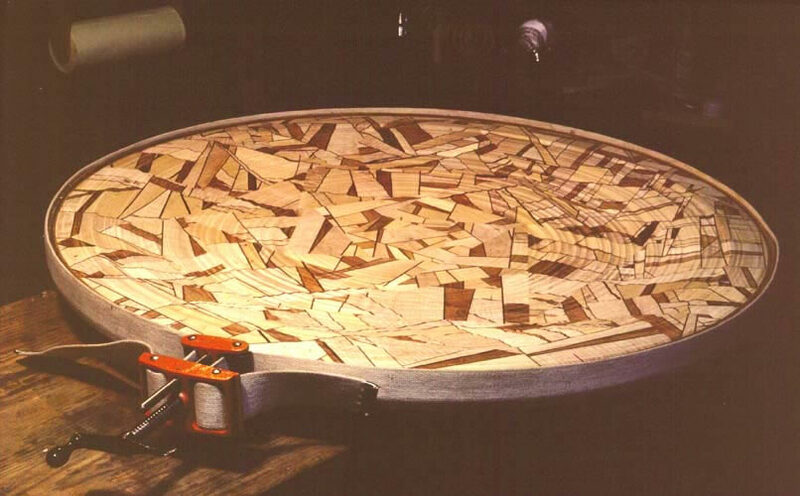 It's a lot of trouble to make a block of wood such as the one this platter is turned from. If you look closely you will see that some of the joints in the piece are not accentuated with the dark veneer (roll your mouse over fig. 1). I wanted to hide these joints, as they would then show the pattern in the figure 2. I started with just the small hexagon in the center (#1). This piece only needed to be about 1/2" thick. Next I added the triangles (#2 - #7) to create a larger hexagon. These pieces needed to be thicker, about 1". The next round of triangles (#8 - #13) thicker yet, 1 1/2" or so. I think there are five rounds all in all. Once the initial block was assembled I brought the piece into round (outboard on my old Craftsman lathe). Next I put the rim on, it's a band of wood made of several layers, I used a band clamp and trued it up after each layer. The rim locks everything together. 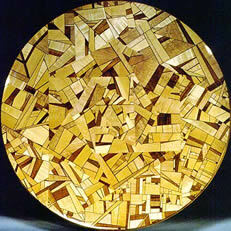 I tried using a router to power carve the piece (see the pictures below) but mostly I just scraped it to shape, since I had not yet acquired any other turning tools. 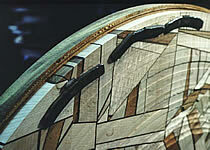 The name of this piece, Makowenaplege is "Maple" - "Koa" - "Wenge", all chopped up and reassembled. This should give you a clue as to why I now just number each piece. 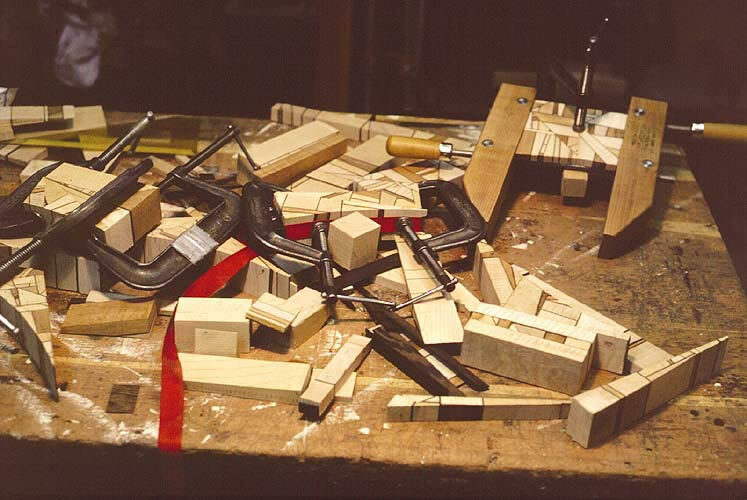 This is what my bench looks like when I am gluing up the block. 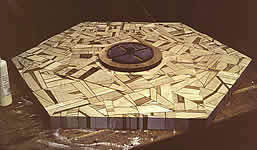 The first picture shows the block from the back side, with a piece for the base glued on and a faceplate screwed to it. In the middle image the block has been turned round. 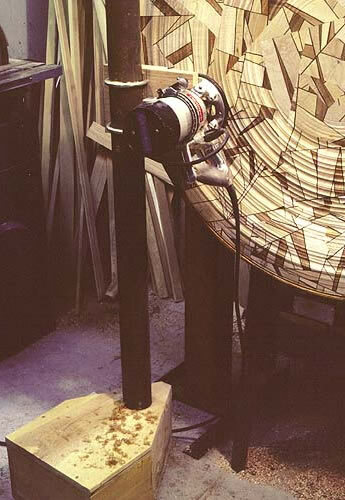 In the third picture the rim is being glued on with a band clamp. I'm not sure why but even after I had trued up the piece it was still quite out of balance, these wheel weights were glued on to balance the piece. 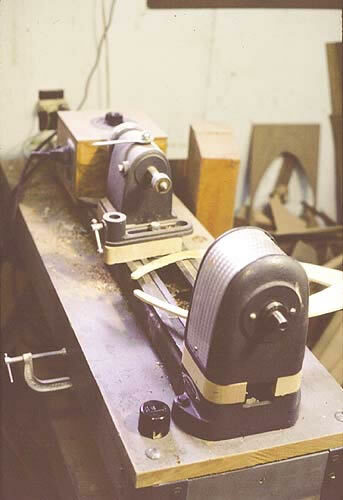 The next image shows the router mounted on a stand, I would start the router, wiggle it into a position where it would do some cutting, then rotate the lathe slowly by hand, the system didn't work very well. 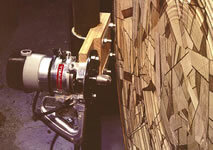 The first image shows the craftsman lathe I was working on at the time. In order to turn outboard, I had rotated the headstock, reversed the motor, and added an idler pulley to reduce the speed. The middle image is another view of the router setup. The last image is the outboard tool rest I made after I gave up on the router. Shortly after this picture was taken I got a new lathe, a General 260. Here's a happy Max with a new lathe and this platter mounted on it.